It was Christmas evening and the community of Bel Air, California, was aglow in festive Christmas lights. Like most stores, Fresh Paws of Bel Air was closed for the holiday. Ashlee, a cockapoo with big dark brown eyes, sat gazing out the glass door of the pet store, perhaps hoping that someone would walk by and realize they had forgotten to get that dog on their child's Christmas list. That's where Natalie Kiwi, her husband, Jeff Schenck, and their three boys, Aidan, nine, Ryan, six, and Owen, four, first saw her. The family had just spent the holiday with family and friends and decided to take an evening walk to the nearby Starbucks. They passed Fresh Paws on the way. "She had somehow escaped the pen that all the other dogs were in and was sitting quietly at the glass door to the store with her big eyes staring out at us," Natalie says. "It was almost like she was waiting for us." Jeff swears that Ashlee was "telling us to take her with us." The boys felt sad leaving her that night. Along with their father, they begged Natalie to agree to return to the store the next morning and make Ashlee part of their family. Natalie stood her ground: They were not getting a dog. It wasn't that Natalie didn't like dogs - she loved dogs and had them growing up - but she felt their home was chaotic enough with three growing boys all under the age of 10. Jeff describes their home as "organized chaos." But it was four against one. By morning, they had broken her down. "I finally had to give in," Natalie says. It would turn out to be one of the best decisions she ever made. Ilene Katz and Linda Massaro opened Fresh Paws of Bel Air last October with a humane business model of featuring only rescued animals for adoption, instead of purchasing puppies from mills - mass commercial breeding operations where dogs are housed in terrible conditions and get little, if any, human attention or veterinary care. You won't find any puppy mill dogs with $1,000 price tags at Fresh Paws, just a whole lot of wonderful canines from area shelters and rescue organizations. Dogs like Ashlee. Ashlee came to Fresh Paws from a California kill shelter where she had been left by her elderly people when they could no longer care for her. She's just one of many dogs who've found wonderful new lives, thanks to Fresh Paws and a growing number of pet stores that have adopted a humane business model. Ilene and Linda have watched it make a big difference not only in the lives of dogs but in the lives of the people who adopt them. "These dogs are so smart," Ilene says. "I really believe they change people's lives. They make them better." Adoption fees range from $495 to $695, and half the fee goes back to the shelter or rescue organization. The rest of the fee helps pay the costs of caring for the dogs. All of the dogs are spayed or neutered, vaccinated, microchipped and given behavioral assessments before being featured for adoption. Ilene and Linda don't make a profit from the adoption fees. Their revenue comes from the sale of food, accessories and grooming services. It's very much a labor of love. The reward, Ilene says, is in knowing that Fresh Paws is helping to save shelter dogs' lives. "We're tired, but we sleep at night," Ilene says. "We love what we do, and we feel really good about it." Local shelters and rescues bring the dogs to them, and the store features from five to eight dogs at a time. These dogs never have to return to a shelter, though the rescue groups might rotate them with other dogs in their care. The dogs at Fresh Paws always get adopted, though some take longer than others, Ilene says. "They [Fresh Paws] are helping change people's image of what a shelter pet is all about," says Melanie Pozez, founder and director of the Bark Avenue Foundation, one of the local rescue groups that supply Fresh Paws with dogs. Melanie says Fresh Paws has allowed more potential adopters to see the Bark Avenue Foundation's rescued pets, something that has increased the rescue group's exposure and adoption rate. If someone is in the market for a particular breed of dog, Ilene and Linda will ask the shelters and rescues to keep a lookout. It's estimated that one quarter of dogs in shelters are purebreds. Ilene says shelter and rescue dogs make great pets. "These dogs have had a hard life to begin with. They all have a story, and once they know they're safe, they lick you to death. 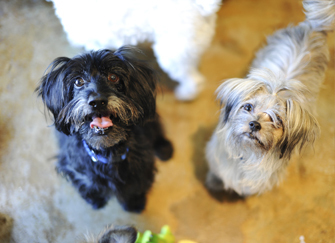 We've placed these dogs into some amazing homes." Rene Karapedian, owner of Pet Rush, a pet store in Glendale, California, truly believed the puppies he had been purchasing from large puppy brokers came from responsible breeding operations. After all, that's what their representatives told him, and he had no reason to think otherwise. They told him they only did business with USDA-licensed breeders and that the puppies were registered by the American Kennel Club. Didn't that mean something? Rene would later find out it didn't. "They [the broker representatives] send you emails and letters telling you the animals are well taken care of and that they only work with reputable breeders," Rene says. "They literally lie to you so they can sell you puppies." Rene believed what the representatives were telling him. That is, until he got a visit from Best Friends volunteer Christy Schilling and her friend, Katya Lidsky, a local animal rescuer, who came to his store one day and told him the truth about where his puppies were coming from. After listening to what Christy and Katya had to say, Rene made a decision right then and there to stop purchasing puppies from brokers and instead feature animals for adoption from area rescues and shelters. Christy reached out to Best Friends, whose puppy mill initiatives, among other things, seek to educate consumers about the connection between pet stores and puppy mills. Best Friends stepped in to help Rene make the transition, and in the summer of 2010, Pet Rush became a rescue-only pet store. Today, Rene gets dogs and cats from shelters and rescues in Los Angeles County and surrounding counties. He also draws from a network of foster homes. Like other rescue-only pet stores, Rene makes his profits from sales of accessories and services such as grooming and daycare. "It's incredibly inspiring to see so many stores taking the humane leap to a rescue-only model," says Elizabeth Oreck, national manager of Best Friends' puppy mill initiatives. "By choosing to stop selling commercially bred animals and instead adopt out animals who might otherwise be killed in a shelter, these stores are not only saving lives, they are taking a stand against the cruelty of puppy mills and supporting the public's willingness to embrace adoption, bringing us one step closer to a time of No More Homeless Pets." Rene suspects there are many other pet store owners who don't realize where their puppies are coming from. He's made it his mission to educate them and hopefully persuade them to adopt the rescue-only model. Rene can see the difference his store is making. "Our customers tell us they got the most amazing dogs and how these dogs changed their lives," Rene says. "Maybe these dogs realize they got a second chance." The animal welfare community has criticized Petland stores for selling puppy mill dogs, but a few Petland franchise owners have decided to go the humane route. David and Robin Visniski's Petland store in Tyler, Texas, has been "rescue only" for almost 20 years. "It was the right thing to do," David says. "We're dog people first, and retailers second." The couple began by approaching the local humane society and telling them they wanted to help find homes for their dogs. "We took in their overflow," David says. A couple years ago, when the humane society went from being the open-admission shelter for the city and county and became a no-kill sanctuary, David and Robin started taking in unwanted litters of puppies and kittens from people in the community. (They never take litters from breeders.) People have to agree to have the mother dog or cat spayed, which David and Robin do at their own expense with help from veterinarians at the local Flint Veterinary Clinic, who provide them with low-cost services. "We think this is a win-win situation for everyone involved," says Dr. Mike Dixon, one of the veterinarians at the Flint Veterinary Clinic. "The people with the litters now have an avenue for those puppies and kittens [to get adopted], and they get their mother dog or cat spayed, so it's not a perpetual cycle. And we have the potential for adding new clientele." All the puppies and kittens are spayed or neutered, vaccinated and microchipped at the clinic before being put up for adoption at the Tyler Petland. Their people receive a free veterinary visit after adopting them and a 25 percent discount on veterinary services for a full year. Petland also gives people who adopt their puppies and kittens a 20 percent discount on supplies. Adoption fees range from $200 to $250, and all the money goes back into the program so David and Robin can continue to save more lives and give back to their community. Like Fresh Paws, David and Robin's Petland makes its profit from the sale of pet food and accessories. "We've made it for 19 years, so I guess we're doing something right," David says. Last fall, the Petland in East Liberty, Pennsylvania, also jumped on the rescue-only bandwagon. "We wanted to serve the needs of the community," says Marci Caplan, who owns the store with her husband, Eric. "This is a good thing for everyone involved." Marci and Eric reached out to their local shelters and rescue organizations for dogs and cats to feature at their store. One of those organizations is Western Pennsylvania Humane Society, an open-admission shelter in the community. The East Liberty Petland now features its dogs, cats and rabbits for adoption. Lee Nesler, the shelter's executive director, says Marci and Eric's program is helping free up space in the shelter. "When we have more space available, we're able to save more lives," Lee says. She says the East Liberty Petland also provides a venue for people who want to adopt a shelter pet but find it emotionally difficult to go into a shelter. Like the Petland in Tyler, the Petland in East Liberty also receives discounted veterinary services from its local Point Breeze Veterinary Clinic. It all shows that when it comes to saving pets in a community, it truly takes a village. The Salty Paw, a trendy pet store in the Big Apple owned by Amanda Byron Zink, helps shelter and rescue pets in its community by sponsoring fundraising drives and featuring them in adoption events. "The Salty Paw is a wonderful shop," says Jamie Lyn Rubin, manager of Best Friends' New York City programs. 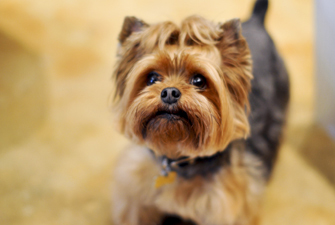 "They provide much more than just great grooming services and unique accessories. They genuinely care about helping animals. They are incredibly supportive of local New York City animal rescues, promoting them through adoption events they host, as well as supporting Best Friends New York. They came out and attended our first Strut Your Mutt and were hugely helpful in promoting the event beforehand, with flyers inside the store and, to our surprise and delight, even tweeting about the event. We are very grateful to the Salty Paw for their consistent love and support for the animals of New York City." The store has a year-round collar, leash and coat drive, and clients who've adopted puppies bring back items their puppies have outgrown. "They enjoy the fact that other dogs are able to use them," says Salty Paw manager Janet Carhuayano. Natalie, Jeff and the boys returned to Fresh Paws the day after Christmas and made Ashlee a member of their family. "She waited patiently for us to return the next day," Jeff says. "We had never truly thought of getting a dog until we saw Ashlee. It was love at first sight." Jeff now describes their home as "organized chaos with our furry friend being the pacifier." Natalie agrees that Ashlee was just what the family needed. "They are all very high-energy boys, and Ashlee is so mellow that she calms all of us down," Natalie says. "The boys love playing and cuddling with her." Jeff says Ashlee adjusted to her new home pretty quickly. "We attempted to have her sleep downstairs, but she ended up in our bed that evening as if she'd been doing it all her doggie life." Ashlee's favorite pastimes, he says, are "going for walks, stealing socks and licking people." Ashlee even got to meet Oprah Winfrey one day when the family was at the Four Seasons Biltmore Hotel. "Oprah remarked on how beautiful a dog she was," Natalie says. Jeff and Natalie say Ashlee has brought the family a precious gift: unconditional love. "She has brought so much joy into our family," Natalie says. This article was published in the November/December issue of Best Friends magazine.